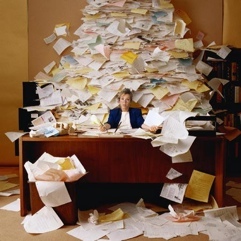 Information overload is slowly becoming one of the biggest health problems in the world, I would even put it in the same class as obesity and depression. Information overload could be categorized as mental obesity because it has very similar characteristics to normal physical obesity. We take in too much information but we do not take care of the quality. Because of this lack of awareness we easily throw our mind into any kind of source of information available, whether it’s TV, internet, newspapers or just a book and we do not build enough protection and filters to avoid the inevitable, first of all just a little overweight, but if it continues it gradually becomes mental obesity. Sarah McCrum explains this a bit further in her new podcast and she also made a special relaxation just for that purpose.